To prep for paint, Nick and I (more so Nick, since I had to be at work), took down and took out every possession kept within our house. Our garage has resembled a flea market of sorts - folding tables piled high with stuff, wall hangings and art work leaning against a wall, and boxes bursting at the seams. The first area I addressed was the space above our kitchen cabinets. I’m drawn to the eclectic, layered look but I didn’t want it to come off as cluttered. I also tried to balance both sides of the cabinetry with a focus on symmetry. I continually tinker with it, but I feel like it’s added height to our kitchen area. Besides the paint job, there isn’t much more to be done in this space, since it already has good flow. I’ve also put a heavy focus on my closet. It’s so fresh with the gray walls and white shelving. Without doors, I’m trying to maintain a crisp aesthetic. I ordered white storage boxes from IKEA for additional storage. I also spent $20 on a pair of basic shoe racks from Target. 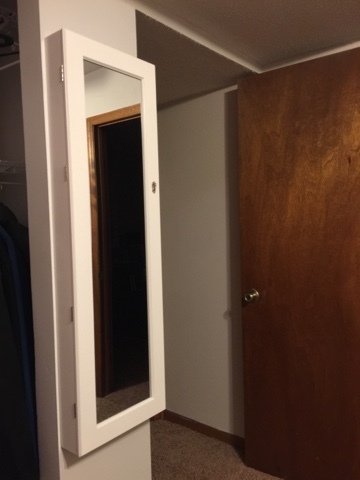 And recently, I purchased this jewelry armoire that I can hang on the wall, which also serves as a full-length mirror. I like it for a variety of reasons. It’ll balance the light gray color on my walls. It comes with a skeleton key to lock up my jewelry collection. Price-wise, my collection overall isn’t very valuable; but to me, it’s priceless. 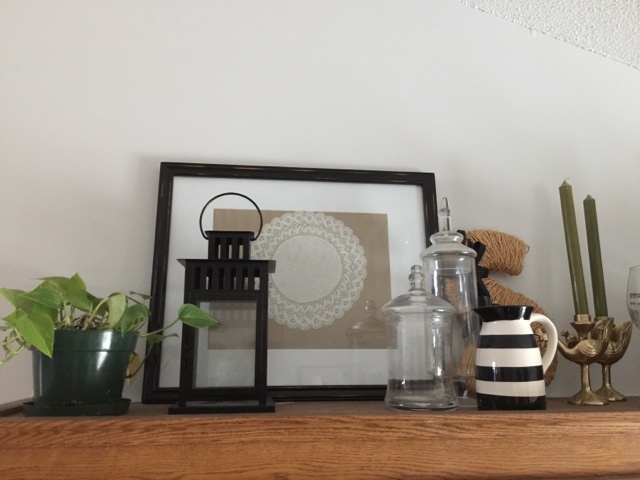 So many pieces are gifts from my husband, my children and my family, that I treasure it. 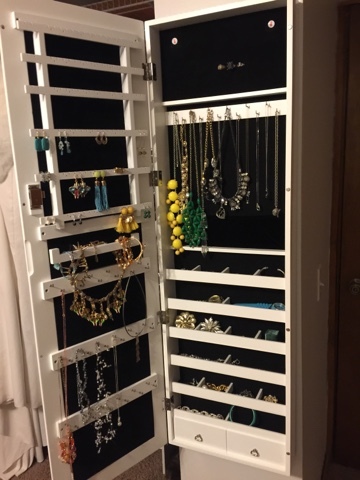 I’ve spent some time testing different jewelry organization options. None of them really “worked” for what I was hoping to achieve. This armoire purchase will hopefully utilize an otherwise wasted space, while keeping my jewelry all in one place. It’ll be out of sight, yet everything will be completely visible when I open it up so I’ll never face the “I forgot I had this” conundrum again. It feels like we crossed a major hurdle now that the walls are painted.